I don't remember when I first started hearing about Instant Pots, but the buzz has been building and I was intrigued...here's my story! I must start with a shoutout to my brave friend Jen for lending me her cherished Instant Pot. I mentioned I was toying with the idea of buying one and giving it a whirl, and she said I could give hers a test run. How generous! It's a fast-acting pressure cooker that resembles a slow cooker crossed with a futuristic rice cooker and comes with every other bell and whistle you can think of (porridge anyone?). The issue: it's intimidating! So many buttons! And what is pressure cooking anyway? Will it explode? What are those noises? After staring at Jen's pot on my kitchen counter for almost a week, I decided I had to least try it before I returned it to her. There is one important step I took prior to my launch: Jen walked me through how to put the lid on and off (yes, instruction is necessary for this), how to use the quick release steam valve (it's a thing), how to clean it, and she pointed out a couple of other functions. If you want to give one a go, I highly recommend having one of your Instant Pot friends do a hands-on demo for you. Second best option: watch some You Tube videos! 1. I sprayed some Pam in the pot because I didn't want to ruin her pristine stainless steel bowl, and I added a pound of chicken breast tenderloins. Yes, you just plop them at the bottom of the stainless steel bowl. 2. I drained a can of Ro-Tel tomatoes and dumped the contents on top of the chicken. I always have a couple cans of this on hand: it's great to add to taco meat or chili. 3. I closed the lid, set it Poultry, and let it pressure cook for 20 minutes. 5. After stirring and draining the excess liquid, look what I had! A bowl of juicy, moist (sorry to people who have aversions to those words; they're the only accurate ones I can think of!) shredded chicken (it shreds super easily) with a mild salsa sauce! Voila! My very first Instant Pot dish: I call it Salsa Chicken but you could definitely be more honest and call it Chicken & Ro-tel :). Here's the kicker: my son LOVED the chicken and couldn't get enough. That says it all, folks. After scrubbing the washable parts, I tried to give the machine back to Jen, but she insisted I give it another try... I was worried. What on earth would I make next? Wasn't I pushing my luck? I like to end on a good note, but she was right. Before I buy one, I should try one 'step up' recipe. Did you know you can brown ground meat in this thing? Yeah, that's what I wanted to do. Enter my vision of making a big pot of chili all in one pot. No separate frying pan to brown the meat first. But where to begin?! So many sites have complicated recipes they say are simple, but come on. Most involved all kinds of button pushing. I wanted to be as hands-off as possible. Luckily, I eventually found a great turkey chili recipe on Oh Sweet Basil. Did I have everything on hand their recipe required? Of course not! So I subbed in a few things I had in my pantry and it still turned out fantastic. I feel like my food images don't do it justice, but it smells delish and tastes even better! YUM! 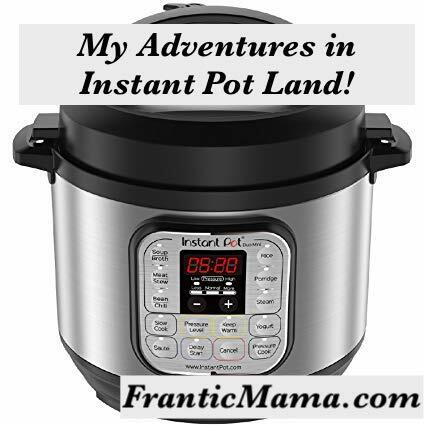 In the meantime, I'd love to hear if you have an Instant Pot, if you've tried it, and if you love it or hate it! I had only one can of beans (I used Great Northerns). I subbed one of the two cups of chicken broth for one cup of tomato sauce. I didn't add the bacon (didn't have any).